Driving with the sun directly in your face isn’t just an annoyance – it can consequently be deadly. In addition to heat blockage auto window tinting shields your eyes and prevents glare from all sources of light. Make your Houston commute both pleasant and better by installing auto window tinting. Let’s face it, it’s always a good idea to keep a low profile throughout Houston. Auto window tinting guards your personal privacy. Not only that, but it also protects the things inside your car when you’re not around. No more stashing your valuables out of sight every time you park! The Houston’s heat and UV rays can turn your upholstery into a mess. Did you know this is highly preventable? For example car window tinting can keep your interior from getting hot enough to warp, fade, or crack. By blocking up to 99% of harmful UV rays your interior can be preserved longer. Window Tinting can also helps to keep your car’s window from shattering upon impact or in the event of an accident. Besides privacy and heat reduction protecting the health and lives of your passengers is important. Should anything unexpected happens on Houston’s road window tinting can aid in that protection. Finally the right auto window tint, can reduce the heat inside your car. In Houston’s scorching summer months auto window tinting can block up to 98% of heat. Keep the heat out and enjoy your daily driving. Houston’s direct sunlight and the associated UV rays doesn’t just damage your skin and accelerate ageing. It can also cause skin cancer over a prolonged period of exposure. Nearly 53% of skin cancer in the US occur on the left or Drivers’ side of the body. Reduce harmful UV rays by up to 99% by installing quality car window tinting. Through the help of AIM we join the fight against Melanoma. 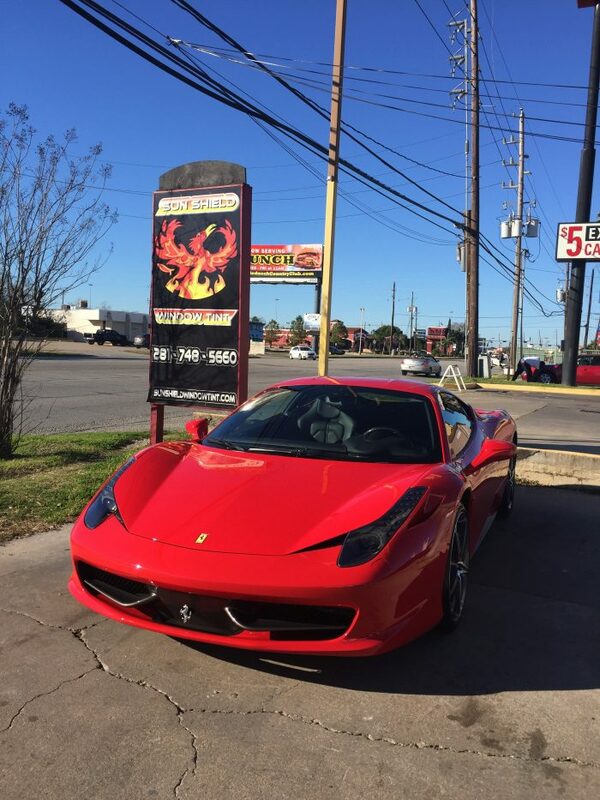 Call us today at (281) 748-5660 to get your car window tinting with custom computer fit window tint. Auto window tinting serving Houston, Sugar Land, Missouri City, Pearland, Katy, and surrounding areas. Contact us for further questions or concerns.